It is our third day in Cambodia. Since the itinerary in the fourth day was quite short, so I have decided to combine them into one post. For the third day, we had visited Beng Mealea Temple, Koh Ker Temple and Tonle Sap and Kampong Phhluk. 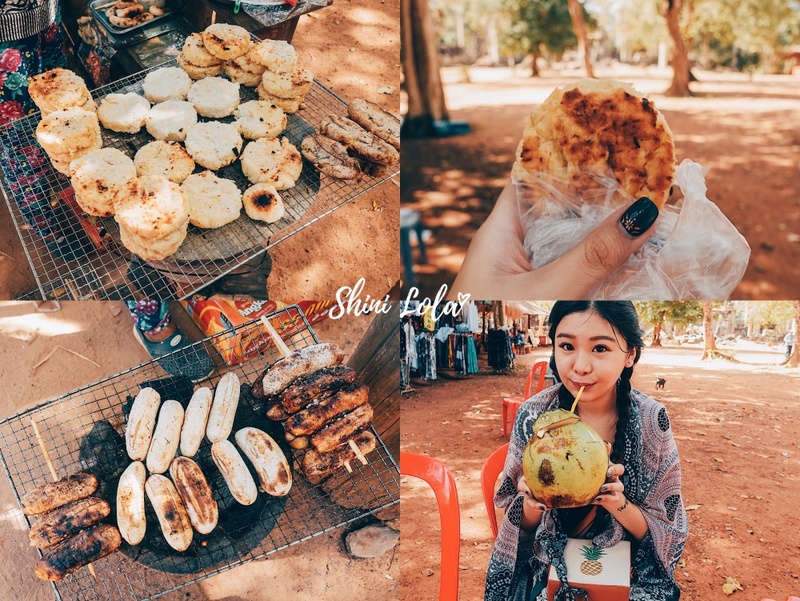 This is the last post of my Cambodia trip and I hope you guys really enjoy reading it. Any question about the trip, feel free to leave a comment. I will try my best to answer you all. So as usual, we had our breakfast at the random restaurant. Our driver brought us here so we have no idea what's the restaurant name (we only remember those restaurants that in our itinerary). We told our driver to bring us to the hygiene restaurant which served local food and he did. So bravo to him. What we had today was a clean broth noodle soup with some chicken slices. 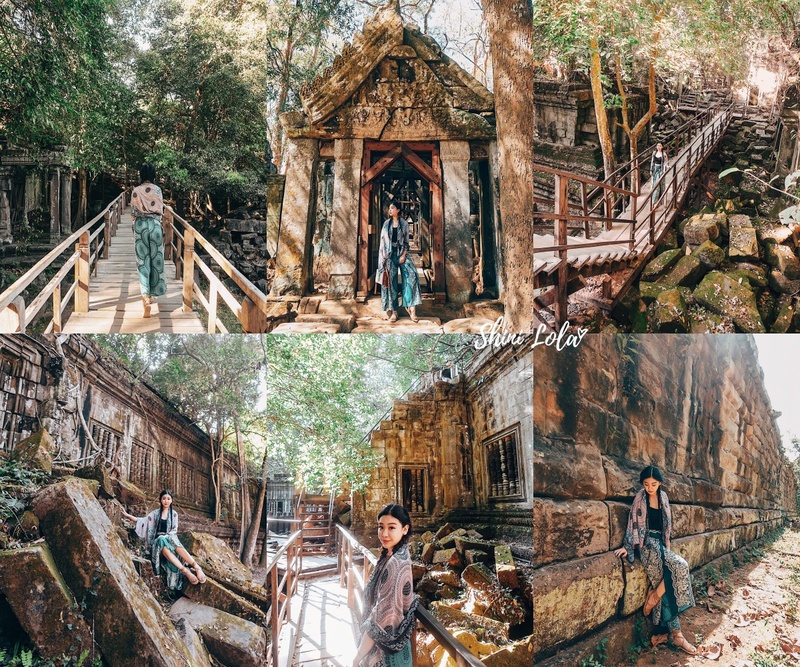 Our first stop was Beng Mealea (its name means "lotus pond") is a temple in the Angkor Wat style located 40 km east of the main group of temples at Angkor, Cambodia, on the ancient royal highway to Preah Khan Kompong Svay. It was built as a hinduist temple, but there are some carvings depicting Buddhist motifs. Its primary material is sandstone and it is largely unrestored, with trees and thick brush thriving amidst its towers and courtyards and many of its stones lying in great heaps. 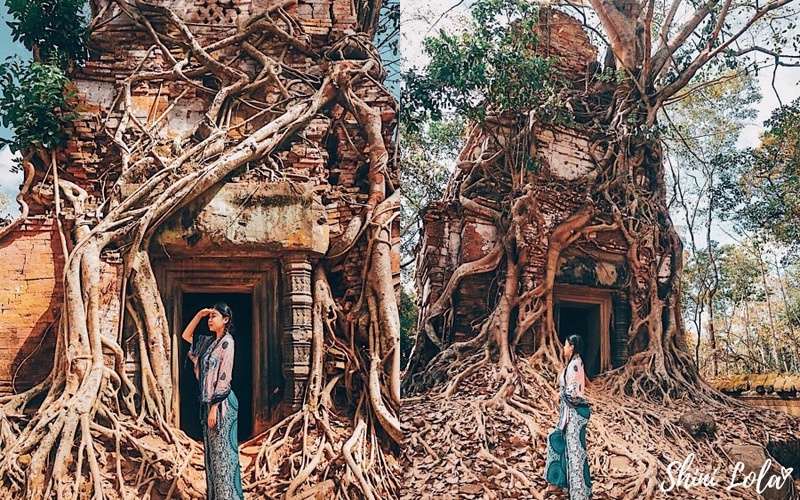 For years it was difficult to reach, but a road recently built to the temple complex of Koh Ker passes Beng Mealea and more visitors are coming to the site, as it is 77 km from Siem Reap by road. Map of Beng Mealea, from a drawing by D'apres Leon de Beylie (1849-1910). In red the partially equipped path used to visit the temple. Beng Mealea is oriented toward the east but has entranceways from the other three cardinal directions. The basic layout is three enclosing galleries around a central sanctuary, collapsed at present. The enclosures are tied with "cruciform cloisters", like Angkor Wat. Structures known as libraries lie to the right and left of the avenue that leads in from the east. There is an extensive carving of scenes from Hindu mythology, including the Churning of the Sea of Milk and Vishnu being borne by the bird god Garuda. Causeways have long balustrades formed by bodies of the seven-headed Naga serpent. Then, we head to Koh Ker. 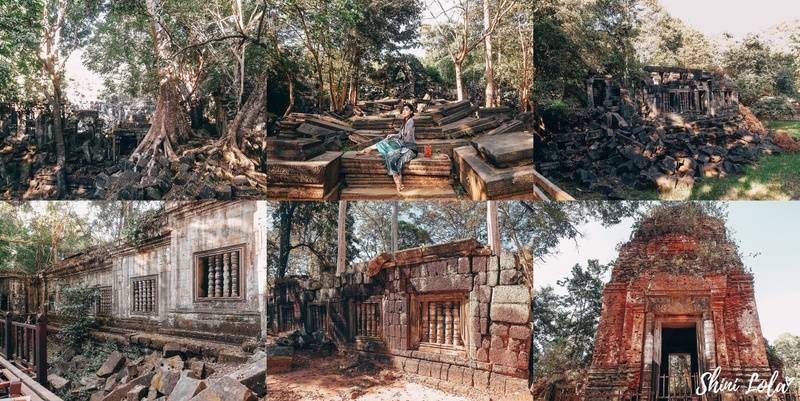 It was once an ancient capital of Cambodia, located in Srayong Cheung village, Srayong commune, Kulen district, about 49 kilometres west of the provincial town. The Koh Ker complex is on the Chhork Koki highland. It was built by King Jayavaraman IV (AD 928-942). Koh Ker temple is 35 meters high, and its design resembles a seven-stepped stupa. The temple faces west toward Angkor city. It was built to worship Treypuvanesvara, the god of happiness. The Koh Ker complex is along a trail that is about 3 kilometres long. The first temple, Neang Khmao sits atop a small hill on the east side of the trail. The temple, which faces west toward Angkor city, is made of sandstone. It is 20 meters high and resembles a stupa. The temple terrace is 2 meters high and divided into three decks. The temple is surrounded by a laterite rampart, 44 meters square and 2 meters high. The rampart has only two openings; one on the east side, and the other on the west. The temple once housed lingam and yoni, but the only yoni remains. The lintel sculpture has been damaged, but otherwise, most of the temple is in good condition, while nearly three-quarters of the rampart is good condition. After visiting the temples, our driver brought us here to enjoy some local snacks. I had try some local fruits, coconut water and something which is potato mixed with coconut flakes (I have no idea what is it called) but it tastes delicious though. 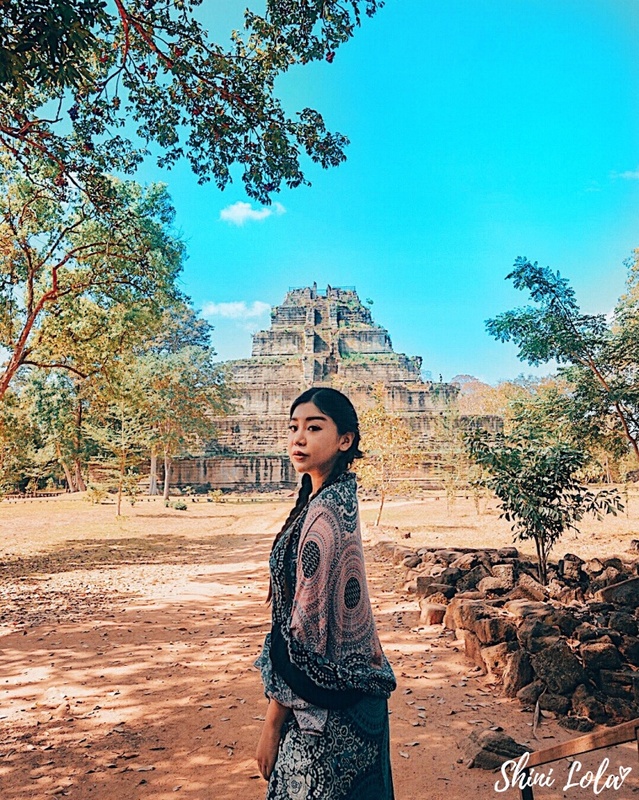 Som Ros Neary Khmer 高棉妇女. I guess our driver knew we are hungry, so before sunset, he brought us to Som Ros Neary Khmer to have our lunch. I had ordered Fish n' Chips and surprisingly it tastes good too. Finally, I got to try their Western food again. 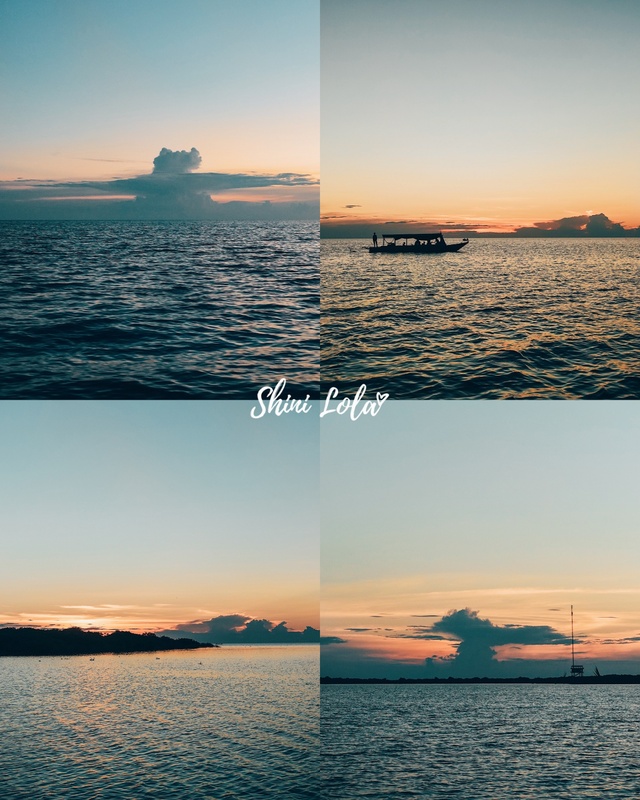 Tonle Sap Lake - Kompong Phluk. Located 17 km outside of Siem Reap is the Tonle Sap Lake, the largest freshwater lake of Southeast Asia. 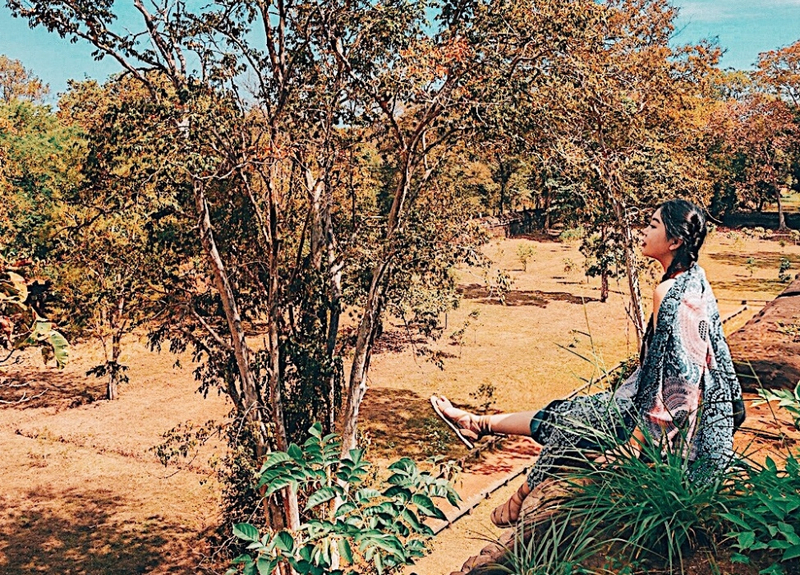 An abundant fishing lake with murky brown waters, it’s home to crocodile farms, mangrove trees and farms a variety of fish, which feeds about half of Cambodia. The biggest attraction for tourists, however, is that it harbours communities of floating villages - boathouses to houses raised upon stilts up to 10 meters high! The Kompong Phluk village is home to approximately 3000 predominately Khmer fishing people, where, depending on the time of year, you will either sail on through the main street of the village (when the water is high the roads become a river) or walk along it in the low water level season. Whichever way it is a great opportunity to see how the rural fishing villages work and people live and go about their daily tasks. You will see a few schools, a large Pagoda and many stilted homes, some towering as much as 9 meters high, which are built this way to adapt to the changing water levels. It is a lovely and peaceful place to visit at any time of the year. 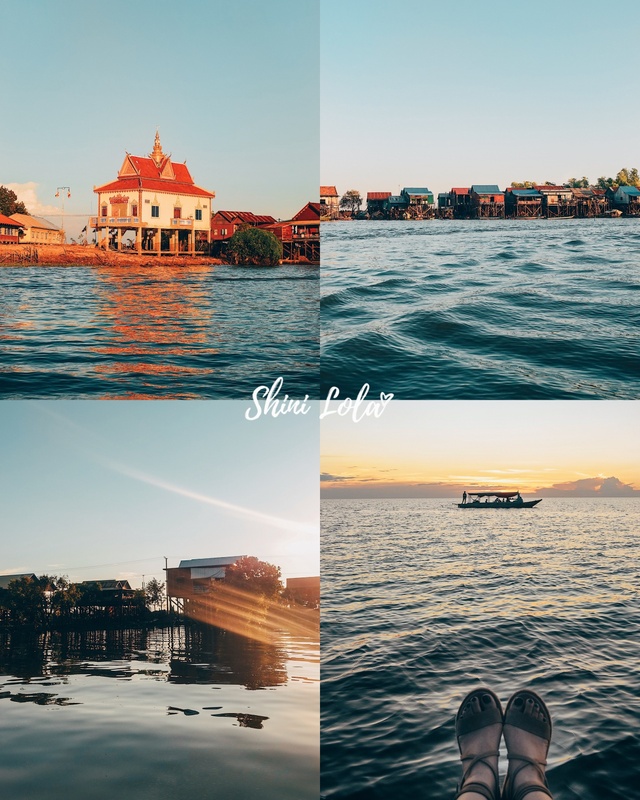 You can visit the incredible floating village of Kampong Phluk, enjoy a cruise on the gorgeous freshwater Tonle Sap Lake and watch for the spectacular birdlife. The sunset is so amazingly beautiful! We had enjoy this spectacular view on our boat peacefully. The last day in Cambodia, I and Joan decided to head to the morning market for our last breakfast in Cambodia. 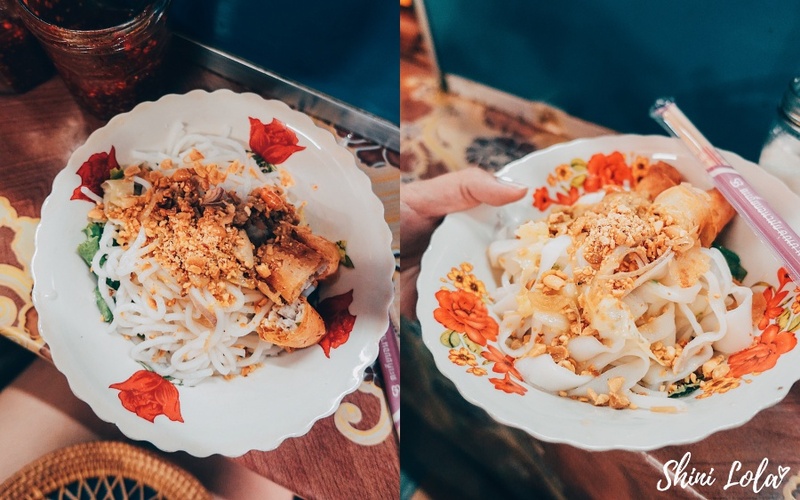 What we had here was a plain noodle mixed with some peanut and fried spring rolls. After finished packed our luggage and check-out our hotel, our driver brought us to another local cuisine to have our lunch before we heading to the aiport. I miss the Banh Mi from Vietnam, so I had ordered this which come with omelette as well. The egg portion is so huge. I can't even finish it. Spot my tired face and tan skin after 4D3N Cambodia trip. Lol. That's all for my Cambodia travelogue. Don't forget to watch the vlog and check out other travelogues. XOXO.